This amazing cup and saucer is just so elegant and well done. 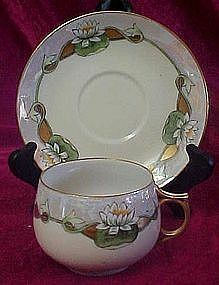 Hand painted water lilies circle the cups top and the edge of the saucer. lavish use of gold highlights the hand painted design and the pearly lustre border. Cup hasa sweeet round shape and is nice and thin. These are in pristine condition. No makers mark or stamp. You will love adding them to your collection! !